A Course by Ms Sunanda Sh. 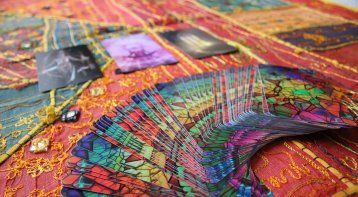 . .
Tarot Card Reading is considered as one of the foremost prediction sciences and is widely followed across the world. It is believed that an expert Tarot reader can address all your problems and suggest effective solutions. 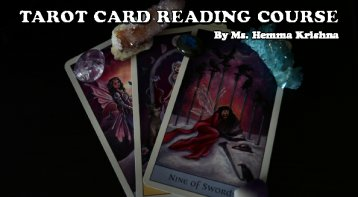 Each of these cards signify a meaning and higher purpose and the trick is to read them right. -Participate in a session to understand what these cards have in offer for you. -Identify the root-cause of any issues and the suitable remedies for them. -See how the past, present and your future comes together in this one-of-a-kind experiential engagement. -A session with the expert also helps you calm your mind and clear your thoughts, thereby enabling you to get in touch with your inner side and intuition to take better decisions and choices with the help of Tarot guide. 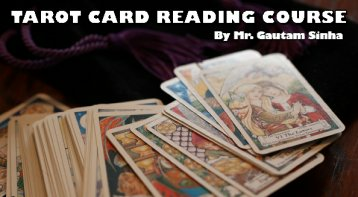 Come and attend this comprehensive course on Tarot Card Reading! Sunanda is a Tarot card reader, Angel card reader, a gifted Psychic, Vibrational Healer, Crystal healer, Reiki master, Dowser, advanced SRI VIDYA LEVEL 3 (Shivyog) Sadhak, Counsellor, Soft Skills Trainer. Sunanda is also the recipient of INDIA’s most prestigious award “THE TAROT SUPER ACHIEVERS AWARD-2012” for TAROT DIVA’s in INDIA BY NGO BHARAT NIRMAN and Winner of SUPER ACHIEVER’s AWARD-2013 for SPIRITUAL COUNSELING by NGO Bharat Nirman. She has authored two books “INSPIRATION FROM THE SPIRIT” Vol I and Vol II and has been offered shows by Sahara TV. Hailing from India, Sunanda has been blessed by ‘Father of Indian Healing’ Guru Avdhoot Baba Shivanand. She has had many paranormal experiences fueled her curiosity and made her follow her ‘true calling’- Metaphysics and the ‘world beyond’. The corporate world never amazed her, and she always craved for something more intense. Sunanda's true calling came in the form of holistic healing which she could not resist. 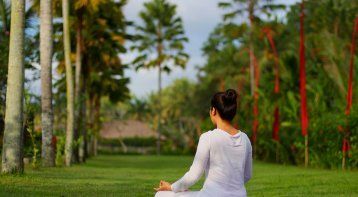 When she embraced the alternative healing, she became a transformed person. Now, she is dedicatedly working towards spreading the healing power of the universe. Please call our expert, Dr. Sangeeta Kapoor, on 9808125113. Please note that our experts accept calls between 10 a.m and 7 p.m only.